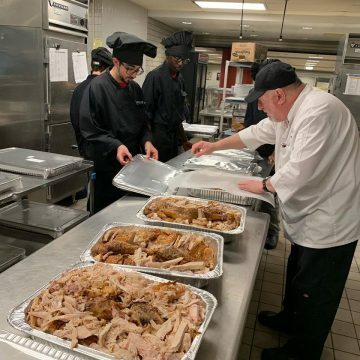 The students prepped, cooked and packaged 150 pounds of turkey. The food was donated to the organization and delivered to CMTHS the week before thanksgiving to allow the 12 frozen turkeys to thaw over the weekend in the school’s walk-in refrigerator. “It has been our pleasure here at CMTHS to serve our communities in any way we can,” said Chef John Everett who teaches at the school. Representatives from CHOC picked up all of the prepared food products Wednesday morning to be served the next day and reported back that there was plenty of food, even some leftovers, for the participants.